1. Thank the person who gave it to me. 2. Sum up my blogging philosophy, motivation, and experience using five words. 3. Pass it on to 5 other blogs that I feel have real substance. Flashes of Style - Bonnie has such a great style and I love every single one of her outfits. page sixxx - Jamie-Lee is another blogger with awesome style! She has an awesome wardrobe! Twitch Vintage - Robyn has such a great eye, every week she adds tons of gorgeous clothes to her online eBay store. Her personal style is wonderful too! See You In Sweden - I have only been following her blog for a few weeks but Rebecca has awesome items and always looks very put together and pretty! Congratulation Hun you did deserve it! I love your header is that a original sketch by you? Congrats you definitely deserve it! And ill be checking all those blogs out now! Thanks!! 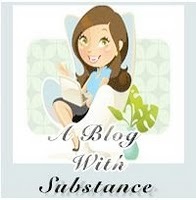 I would agree that you are definitely a blog with substance! awe. My heart swells. Thank you so much.